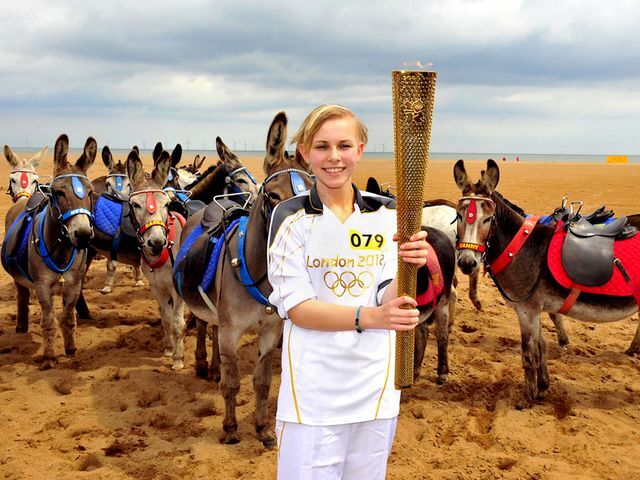 Starr Halley, a 15-year-old student in King Edward VI Humanities College in Spilsby, with Olympic Flame in Skegness, England, a seaside town and resort in East Lindsey, on Lincolnshire coast of the North Sea (June 27, 2012) . She is one of 8,000 torchbearers in Torch Relay, which continued 70 days, traveled 8,000 miles and marked the start of the London Olympics. Starr Halley was diagnosed with a malignant brain tumour in 2009 and underwent a surgery and treatment.